1998— Diving along the mid-ocean ridge at 21°N on the East Pacific Rise, scientists within the deep submersible Alvin peered through their tiny portholes two decades ago to see an astonishing sight: Clouds of billowing black “smoke” rising rapidly from the tops of tall rocky “chimneys.” The “smoke” consisted of dark, fine-grained particles suspended in plumes of hot fluid, and the “chimneys” were made of minerals that were rich in metals. Using specially designed fluid bottles and temperature probes, Alvin took samples of these black smoker chimneys, as well as the 350°C fluids venting from them. Since then, scientists have observed and sampled numerous active vent sites along portions of the mid-ocean ridge in the Atlantic and Pacific Oceans, and in back arc basins in the Pacific Ocean. It has become abundantly clear that these high-temperature seafloor hydrothermal systems are the analogs to systems that created some of the world’s economically valuable mineral deposits, including some that have been mined on land. In Cyprus and Oman, for example, ore deposits of millions of tons are found in ophiolites, portions of ancient seafloor thrust onto land by tectonic forces. Scientists can gain much insight into hydrothermal processes through detailed studies of these exposed areas of fossil systems, but only by investigating active systems can they simultaneously examine hydrothermal fluids and the corresponding mineral deposits created by them. By analyzing these fluids and deposits, we have been able to formulate models to explain how submarine mineral deposits, from seafloor chimneys to great subseafloor depths, are initiated and how they grow in their early stages. One of the most fascinating aspects of black smoker chimneys is how rapidly they form. They have been measured to grow (after upper parts of the chimneys are razed by sampling) as fast as 30 centimeters per day. Examination of young chimney samples, under the microscope and by X-ray diffraction, revealed that the earliest stage in the creation of a black smoker chimney wall involves precipitation of a ring of a mineral called anhydrite. The ring forms around a jet of 350°C fluid, which exits the seafloor at velocities of between 1 and 5 meters per second. Anhydrite, or calcium sulfate (CaSO4), is an unusual mineral because it is more soluble in seawater at low temperatures than at high temperatures. Seawater contains both dissolved Ca2+ and SO42- ions, and when it is heated to 150°C or greater, the ions combine and anhydrite precipitates. Hydrothermal fluids contain little or no sulfate, so the origin of the sulfate in the precipitated anhydrite is seawater. Calcium, however, is present in both seawater and hydrothermal fluid. That made it more difficult at first to determine whether the initial anhydrite chimney wall formed solely from seawater that was heated by hydrothermal fluids, or from the mixing of cold, sulfate-rich seawater with hot, calcium-rich hydrothermal fluid. Strontium, which is present in seawater and hydrothermal fluid, was used to investigate this problem. Strontium has the same charge as calcium and a number of different, easily measurable isotopes. (Isotopes are elements having the same number of protons in their nuclei, but different numbers of neutrons. Thus they share chemical properties but have slightly different physical properties.) Strontium can readily take the place of calcium in the crystalline lattice that forms when anhydrite precipitates. The concentration of strontium, as well as the ratio of two of its isotopes, strontium 87 and strontium 86, were measured in both vent fluid and in seawater. Because the ratio of strontium 87 to strontium 86 is higher in seawater than in hydrothermal fluid, it is possible to determine whether the source of the strontium (substituting for calcium in newly formed anhydrite grains) is seawater or vent fluid. The answer is both: Anhydrite walls form from the turbulent mixing of seawater and hydrothermal fluid, not just from the rapid heating of seawater. During this mixing, other processes occur during early stages of chimney growth. Metal sulfides and oxides (zinc sulfide, iron sulfide, copper-iron sulfide, manganese oxide, and iron oxide) precipitate from the vent fluids as fine-grained particles, most of which form a plume of “smoke.” Because bottom seawater is denser than the mix of seawater and hydrothermal fluid in the plume, the plume rises some 200 meters above the ridge to a level of neutral buoyancy. Some particles form close to the chimney and become trapped within and between grains of anhydrite within the nascent chimney walls. These particles give the anhydrite, which is white in its pure form, a gray to black color. Copper-iron sulfide (chalcopyrite, or CuFeS2) begins to precipitate and plate the inner surface of the chimney. The evolving chimney walls are thin, ranging from less than a quarter of an inch to a few inches, but on either side of them are large gradients of pressure, temperature, and concentrations of elements. Aqueous ions, including copper, iron, hydrogen sulfide, zinc, sodium, chloride, and magnesium, are transported from areas of high to low concentrations (by diffusion). These elements also are carried by fluids flowing back and forth across the wall from areas of high to low pressure (by advection). As a result of these processes, zinc sulfide, iron sulfide, and copper-iron sulfide precipitate in the interstices of the chimney walls. The chimney walls thus become less porous and more metal-rich over time. Early examinations of black smoker chimneys resulted in a model of chimney growth that is still accepted nearly 20 years later. But in terms of size and ore grade, black smoker chimneys are not important mineral deposits. Most of the metals are lost into the plume that rises into the water column above the vents and is dispersed. In the last decade, the focus of study has shifted to larger deposits present along mid-ocean ridges. 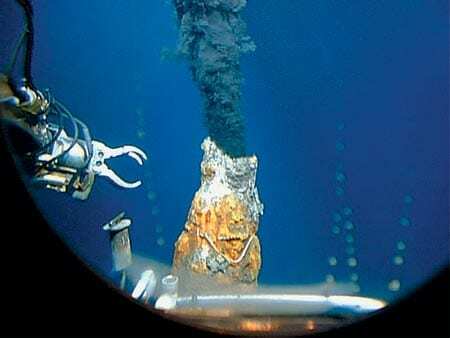 In 1985, scientists aboard the National Oceanic and Atmospheric Administration’s ship Researcher discovered hydrothermal vents at the Trans-Atlantic Geotraverse (TAG) active mound, the single largest known active mineral deposit along the mid-ocean ridge. Roughly circular in plan view, the TAG site has a diameter of about 150 meters and rises some 50 meters above the seafloor, with an estimated mass of 3 million tons. TAG has been intensively sampled. The Alvin, Mir, and Shinkai submersibles have been used to recover vent fluids, chimneys, and other hydrothermal precipitates from the mound surface. And in 1994, 17 holes were drilled into the mound during Leg 158 of the Ocean Drilling Program (ODP). Drillcore was recovered from five mound areas to a maximum depth of 125 meters below the seafloor. As in studies of black-smoker chimneys, the combination of vent fluid data and examinations of anhydrite played an important role in determining the processes involved in growth of the large TAG mineral deposit. In 1990, two distinct fluid compositions were observed to be exiting the TAG mound. From the so-called Black Smoker Complex in the northwest area of the mound, 366°C black smoker fluid billowed from an aggregation of chimneys in a huge black plume that shrouded nearly the entire complex. Approximately 70 meters southeast of this complex, however, clear fluid with temperatures of less than 300°C emanated from an area called the Kremlin, named for its 1- to 2-meter-high chimneys with their distinctive, onion-shaped Byzantine cupolas. The mineral composition of the black smoker chimneys was very similar to those of black smokers at other mid-ocean ridge vent sites. The chimneys forming from the cooler white smoker fluid, however, were quite different, containing significant amounts of zinc, as well as cadmium, silver, and gold. Analyses of the white smoker fluids indicated that they were more acidic and contained less copper, iron, calcium, and hydrogen sulfide, but 10 times more zinc, than the hotter black smoker fluids. However, concentrations of other elements, such as potassium, were identical, suggesting that the two fluids were related to one another. A hypothetical series of steps was soon developed to explain these observations. The deficits of copper, iron, and hydrogen sulfide in the cooler white smoker fluid could best be explained by the precipitation of copper-iron sulfide and iron sulfide (that is, chalcopyrite and pyrite) within the mound. In addition, it was theorized that precipitation of anhydrite within the mound could explain the lower calcium concentrations in white smoker fluids. To trigger the deposition of sulfates and sulfides inside the mound, sulfate-rich seawater would have to percolate down into the mound and mix with the hotter hydrothermal fluid. The precipitation of sulfides would release hydrogen ions, making white smoker fluid more acidic. The increased acidity, in turn, would cause metals in the mound, such as zinc, cadmium, silver, and gold, to dissolve. Once dissolved in the fluid, these so-called “remobilized” elements could be transported toward the upper edge of the mound. This would explain the excess zinc observed in white smoker fluid. At the seafloor, the white smoker fluid, rich in remobilized metals, confronts 2°C seawater just outside the chimney wall. Crossing this thermal gradient, the fluid cools, and some metal-rich minerals precipitate. This process, known as “zone refinement,” explains how some ore deposits are separated into large-scale zones containing different metals, with copper in the center of the deposits, for example, and zinc at the edges. To determine whether the scenario described above was reasonable, we used geochemical modeling calculations, which take into account the thermodynamics of a range of different chemical reactions at high temperatures. The theoretical reactions had to reproduce the already-well-documented composition of the less-than-300°C fluid from combinations of the 366°C fluid and seawater. These calculations demonstrated that the composition of the cooler white smoker fluid we observed could theoretically result from mixing 86 percent black smoker fluid with 14 percent seawater, which would result in the precipitation of 19 parts anhydrite, 8 parts pyrite, and 1 part chalcopyrite within the mound, as well as the remobilization of zinc and other metals by the resultant acidic fluid. These predictions were put to the test when the TAG mound was drilled in the fall of 1994. One of ODP Leg 158’s major findings was that significant amounts of anhydrite are present throughout the mound. Anhydrite has not been seen in analogous ophiolite structures probably because it dissolves at lower temperatures and essentially has disappeared from land-based deposits. But anhydrite was recovered from three of the five sites drilled at TAG. It was present at the base of the deepest hole drilled at the TAG site, to a depth of 125 meters below the seafloor. The drilling revealed that the mound contained wide, complex, anhydrite-rich veins, ranging in size from 1 millimeter to 1 meter wide, which formed as anhydrite precipitated in cracks within the mound. The discovery of anhydrite confirmed the prediction that seawater was entering and traveling through the mound. It also let us determine the proportions of seawater that were mixing with hydrothermal fluid within the mound. Analyses of strontium isotopes from anhydrite grains recovered from various depths in the mound demonstrated that anhydrite was forming from mixtures that ranged from 99.5 percent seawater and 0.5 percent hydrothermal fluid to 52 percent seawater and 48 percent hydrothermal fluid. Samples of anhydrite grains recovered from drilled cores were also used to determine the temperature and salinity of fluids at various points within the mound. When mineral grains form, small amounts of the fluid from which they are forming can be trapped and enclosed within the precipitating grain. As a result, small cavities can form within the mineral, which may contain one or more phases (liquid, vapor, or solid). These are called fluid inclusions. The cavities can range in size from about 1 micron to greater than 1 millimeter, though 3- to 20-micron inclusions are most common. The anhydrite grains from the TAG mound all contained abundant fluid inclusions with two phases: liquid and a vapor bubble. We analyzed fluid inclusions within mineral grains by using a heating-freezing stage attached to a high-magnification microscope. The salinity is determined by freezing the fluid within the inclusion at temperatures of less than -50°C and then slowly heating until the last ice melts. The temperature of final melting is a function of the salt content in the fluid. The temperature of the fluid when it was trapped within the mineral also can be determined by heating the fluid inclusion and measuring the temperature at which the vapor bubbles disappear. With adjustments for undersea pressures, measurements of fluid inclusion trapping temperatures from a number of different anhydrite grains recovered from within the TAG mound indicated very high temperatures (greater than 337°C) throughout most of the mound. 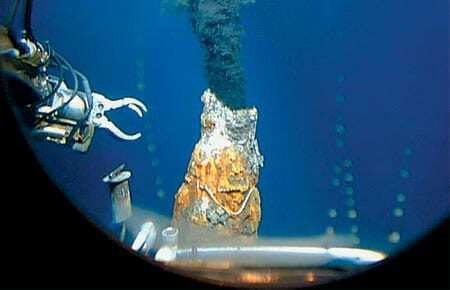 At depths greater than 100 meters below the seafloor, trapping temperatures were in excess of 380°C. The combination of strontium-isotope and fluid-inclusion analyses of TAG anhydrite grains not only demonstrated that large amounts of seawater are being entrained into the mound, they also showed that anhydrite (and chalcopyrite and pyrite) precipitated in the mound from seawater-hydrothermal fluid mixtures that are greater than 50 percent seawater. That led to a dilemma and to another discovery. The dilemma was that our geochemical modeling calculations predicted that if the mixing proportions were greater than 50 percent seawater, and if mixing alone determined the temperature of the fluids in the mound, the fluid temperatures in the mound should be relatively low (5° to 250°C). Our fluid inclusion measurements, however, indicated that the anhydrite grains were nearly all precipitating at much higher temperatures, 187°C to 388°C. The logical conclusion is that the seawater and seawater-hydrothermal fluid mixtures that are entering and travelling through the mound are being heated by conduction. Hot black smoker fluids are flowing rapidly along a direct, highly focused route up through the mound to the Black Smoker Complex. Drilling within the mound revealed extensive accumulations of breccia—rocks made of sulfide-rich fragments that conduct heat well. So it is reasonable to conclude that cold seawater is being conductively heated as it flows through channels bounded by breccias. If enough seawater is being heated in this way, black smoker fluid may be cooled slightly as it rises through the mound to the Black Smoker Complex—from the 388°C temperatures found in the anhydrite grains near the base of the mound to the 366°C temperatures of the exiting black smoker fluids. Results of drilling revealed other important information on the internal structure of the TAG active mound. By dating mound materials, it is possible to reconstruct a history of the mound, showing that it has undergone repeated episodes of high-temperature fluid flow, punctuated by quiescent periods, over a roughly 20,000-year interval. When the high-temperature fluid flow ceases, the anhydrite dissolves, and the chimneys that the anhydrite supports collapse, scattering fragments of rock. When high-temperature fluid flows resume and percolate through these fragments, anhydrite precipitates and serves as a matrix that cements together fragmented chimney pieces and mound materials into breccia deposits. Textures within the TAG breccias indicate that there have been multiple cycles of mound material reworking—a likely consequence of repeated episodes of anhydrite deposition and dissolution. Information from the TAG mound shows how this kind of intermittent activity can, over long periods of time, result in the gradual formation of a large hydrothermal mineral deposit similar to the ore bodies preserved in Cyprus. Studying the large TAG active mound has greatly increased our understanding of how large mineral deposits like these can form. Meg Tivey’s research on hydrothermal deposits has been funded through the National Science Foundation and the Joint Oceanographic Institutions/US Science Advisory Committee. Her work on the TAG active mound has benefited from collaborations with many scientists, including Susan Humphris and Geoffrey Thompson (WHOI), Rachel Mills (University of Southampton), and Mark Hannington (Geological Survey of Canada). Meg Tivey chose to major in geology after taking a course with five field trips to local beaches and fault zones. She then worked as a physical science technician at the US Geological Survey before deciding to pursue graduate studies in marine geology at the University of Washington. She now specializes in studies of active seafloor hydrothermal systems. Her current projects include examining the formation of polymetallic sulfide deposits, continuing work on linking measured vent fluid compositions to observed mineralogy of vent deposits, using X-ray computed tomography (CAT scans) to examine seafloor sulfide samples in three-dimensions, and working with engineers to build instruments capable of measuring temperatures and flow rates on the seafloor in high-temperature and low-pH fluids. During Stage 1 of black smoker chimney growth, hot, calcium-rich vent fluid mixes turbulently with cold, sulfate- and calcium-rich seawater, resulting in precipitation of a ring of calcium sulfate (anhydrite). Metal sulfides and oxides carried in the hot fluid also precipitate rapidly during the mixing process, forming a plume of dark particles above the vent. During Stage 2 of chimney growth, the initial chimney wall of anhydrite forms a surface on which chalcopyrite (copper-iron sulfide) begins to precipitate and plate the inner chimney wall. Mixing of seawater and hydrothermal fluid components across the porous wall by advection and diffusion results in the deposition of zinc, copper-iron, and iron sulfides in the interstices of the wall, which gradually makes the chimney less porous and more metal-rich. In this schematic drawing of the TAG active hydrothermal mound, hydrothermal fluid rises rapidly and exits the mound at the Black Smoker Complex. Cold calcium- and sulfate-rich seawater is entrained into the mound, where it mixes with hydrothermal fluid. The mixing causes anhydrite, pyrite, and chalcopyrite to precipitate inside the mound. This precipitation increases the acidity of the hydrothermal fluid. Zinc and other elements, such as silver, gold, and cadmium, dissolve in this acidic fluid, allowing them to be carried by the white smoker fluid to the edges of the mound at the "Kremlin" area. Here the cooler temperatures within white smoker chimney walls cause the elements to precipitate. 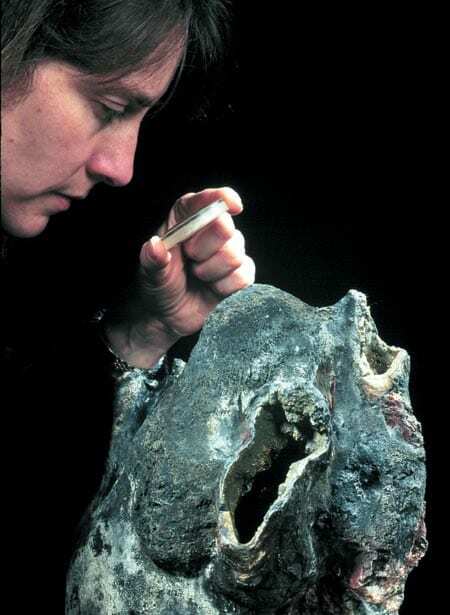 Author Margaret Tivey examines the top of a spire of a black smoker chimney retrieved by Alvin from the East Pacific Rise at 17°S. 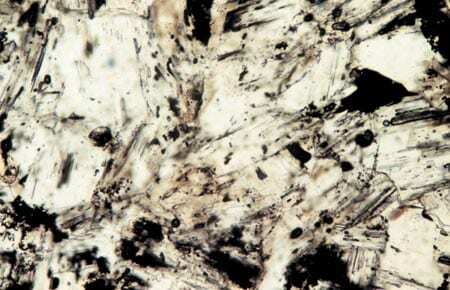 Thin-section samples of chimney wall specimens, examined under a microscope, reveal metal sulfide particles (black) embedded in and around anhydrite crystals (clear).